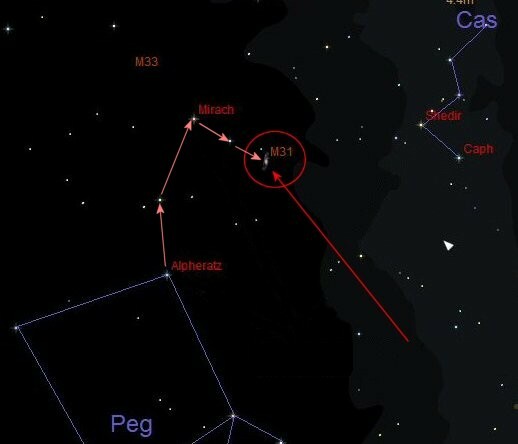 Another popular way to find M31 is by star hopping from Alpheratz, a corner star of the great square of Pegasus. Take the side of the square of Pegasus that faces the “W” shape of Cassiopeia and then go to the star at the top of this edge (Alpheratz). Starting from Alpheratz, hop two brightish stars up to Mirach, then hop one step to a fainter star at a right angle to Mirach as shown below. 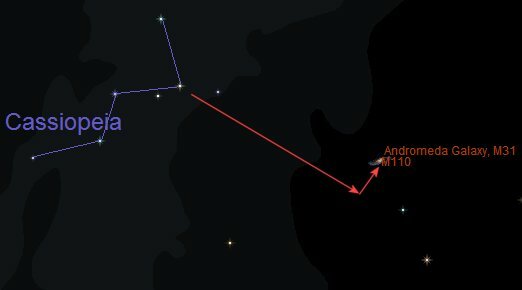 Andromeda will be one further hop the same distance in that direction as shown below.